Naval Piranha is a recurring Piranha Plant boss. It started out as a normal Piranha Plant, but was altered by Kamek's magic during the events of Super Mario World 2: Yoshi's Island. It grew to gigantic proportions, with long thorny stalk and two secondary Naval Buds. As its name suggests, Naval Piranha inhabits the water. In battle, it spits out Nipper Plants. 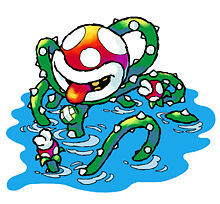 Another Piranha Plant boss that is similar in appearance to Naval Piranha appears in Paper Mario. It is called Lava Piranha, and in accordance with its name, it inhabits lava instead of water. In the original strategy guide for the Super NES version of Super Mario World 2: Yoshi's Island, Naval Piranha is referred to as a male; however, in the guide for the Super NES Classic Edition, Naval Piranha is referred to as a female. Naval Piranha is the boss of World 3 in Super Mario World 2: Yoshi's Island, and reprises the role later in the GBA remake. After being magically enlarged and enhanced, he battles the Blue Yoshi, who throw eggs at its only weak point which is its large and bandaged belly button (with the "X" band-aid). After being hit with enough eggs, Naval Piranha is defeated. Exclusive to this boss is that if the player stands on the very edge of the ledge Naval Piranha is rooted to (or if the player jumps from the water and aims) without triggering the scene, the player can simply throw an egg at its "unmodified" form to defeat it in one hit. A surprised Kamek then approaches, shouts "OH, MY!!!" and flies away, and thus the player clears World 3 without fighting Naval Piranha. In Tetris Attack, Naval Piranha, allied with its Naval Buds, is in the tenth level and the last boss of Easy Vs. mode. It appears in place of the Dragon from the original game, Panel de Pon. 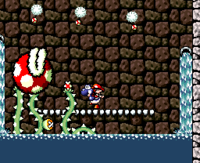 During the introduction to Yoshi's Island DS, Naval Piranha makes an appearance alongside the other castle bosses in the game as the events of Super Mario World 2: Yoshi's Island are recapped. Naval Piranha reprises the role of a boss in Yoshi's Woolly World and Poochy & Yoshi's Woolly World, in this case being the boss of World 4. After being enlarged by Kamek's magic, the monstrous plant jumps to a pipe in the background, and calls forth its Naval Buds. Shy Guys will then throw bombs at the foreground; which Yoshi must swallow and spit out at the mutant flower's open mouth, causing it to swallow the bomb and reveal its weak spot: its belly button. Yoshi must ground-pound it to deal damage. Then, the Naval Buds will create a series of attacks that Yoshi must avoid. Repeating the process two more times will end the boss battle. The Super Mario World 2 reference, with Naval Piranha being prematurely shot again. Similar to Super Mario World 2: Yoshi's Island; Yoshi can throw a Yarn Ball at the sleeping Piranha Plant before triggering Kamek's appearance. This causes a slightly different scene, but Naval Piranha cannot be skipped and must be fought this time in order to progress to World 5. Naval Piranha reappears in level 4-S, where it chases Yoshi through an auto-scrolling level. Yoshi can throw a Yarn Ball at Naval Piranha to make it disappear temporarily, though this does not stop the auto-scrolling and it reappears after a few seconds. It is unknown whether this is the same Naval Piranha as the one fought in the boss level, as it has red vines as opposed to the boss' green vines. If it is able to gobble up the Yoshi while he is moving through the level, he will be instantly defeated. Naval Piranha also reappears in the Boss Tent. It is fought the same way; however, it attacks faster making it harder to hit it. Naval Piranha makes a reappearance in Mario Party Advance. At the Bowser Lab, choosing to see the "scary monster" unveils Naval Piranha. Afterward, Bowser has the player face it in the minigame Koopa Kurl. After winning, the player gets to keep the minigame. The end of game credits say it now lives and thrives in the desert. In Super Smash Bros. Ultimate, Naval Piranha is mentioned briefly by Viridi during Palutena's Guidance dialogue for Piranha Plant. It is referred to in the plural form, implying it is a species rather than a character. Naval Piranha's name has a double meaning, referring both to its aquatic area and the large belly button it grows, i.e. its navel. 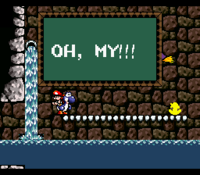 Naval Piranha and Raphael the Raven are the only world bosses in Super Mario World 2: Yoshi's Island to use the extended variation of the boss theme. Not including Baby Bowser, Naval Piranha is one of the only two bosses from Super Mario World 2: Yoshi's Island that make an appearance in Yoshi's Woolly World, the other being Burt the Bashful. The official English website for Super Mario Advance 3 misspells its name as "Naaval Piranha". ↑ "That's not an alligator living in the sewers of the castle at the end of World 3, but a dino-eating plant. Judging by how slow he moves, though, Naval Piranha hasn't encountered many snacks as shrewd as Yoshi. Have you heard of the Achilles heel? Well, Yoshi knows that this ferocious foliage has an Achilles Adam's apple!" - The Super Mario World 2: Yoshi's Island Player's Guide, page 17. ↑ "Yoshi could fight this battle as it was intended, or, if quick enough, can end the confrontation with a single Egg before it even starts! If the Piranha Plant takes damage from off-screen before Kamek arrives, he never has the chance to use his magic on her!" - Playing With Super Power: Nintendo Super NES Classics eGuide, Super Mario World 2: Yoshi's Island World 2[sic] tab. This page was last edited on April 11, 2019, at 17:58.